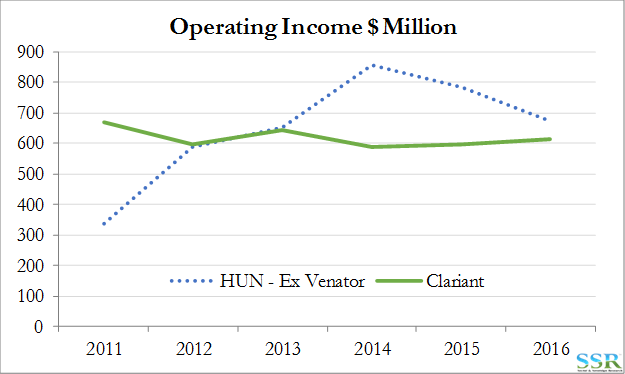 While the activists pushing for an end to the proposed Huntsman/Clariant merger make some good points, it is important to understand what any alternative might look like – and this is where the activists are falling short. We are on record as skeptical about whether the deal will really add any value – but we also recognize the fact that there might not be a better alternative for either company. Both companies are in play – as a result of the merger announcement. If a white knight was going to come from anywhere for either company we would know by now. These are two not terribly attractive companies who have probably correctly recognized that they are better off teaming up than they are trying to go it alone. Companies that have paid high multiples for acquisition based control have generally regretted it in this industry. 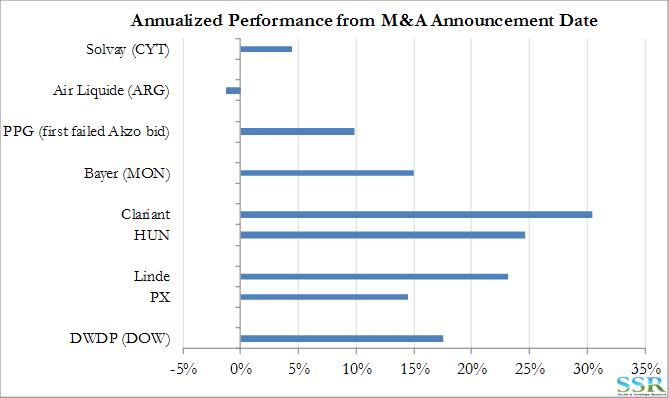 Mergers are the better way forward and seem to be popular with shareholders – DWDP has been a strong outperformer – and the market likes both the PX/Linde and the HUN/Clariant deal. By contrast, high multiple acquisitions have not seen the same reward – Exhibit 1. The activists suggest that combining Clariant with Huntsman dilutes Clariant’s “specialty status”. 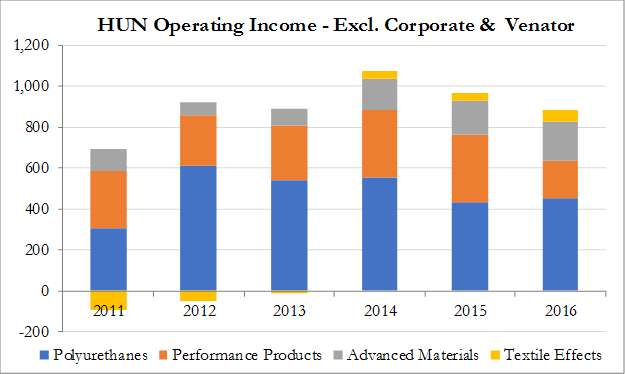 While Clariant has enjoyed a higher multiple than HUN, part of that is because of a better peer group in Europe – HUN is caught without real peers in the US. 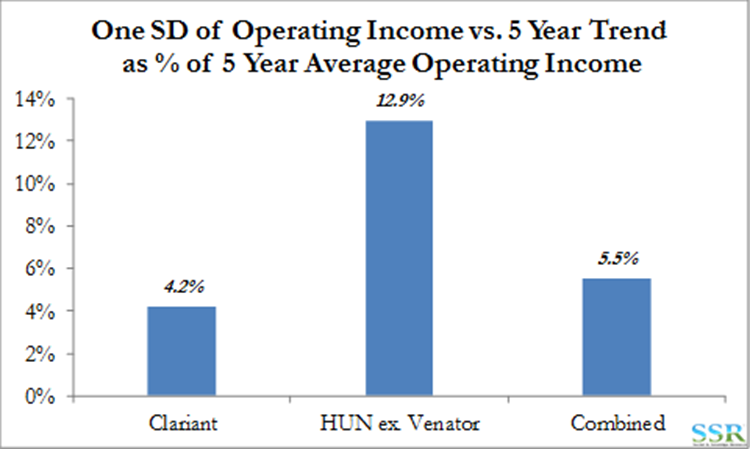 If you take Venator out of HUN’s numbers the volatility of earnings is not that much different than the volatility for Clariant – Exhibit 2. Both companies have businesses that are improving and both have businesses that are struggling – both are best in class in some areas, but not enough to define each company and ensure growth and good shareholder returns longer-term. Dow has seen real top line benefit from integrating disparate chemicals and polymers to create unique customer solutions. Maybe the same exists for a combined HUN/Clariant in the plastics, coatings and care chemicals spaces. We do not see a lot of upside from this merger – given current share prices – unless the companies can over-deliver on synergies, but we see no alternatives for either company and likely go-it-alone strategies that are even less interesting. 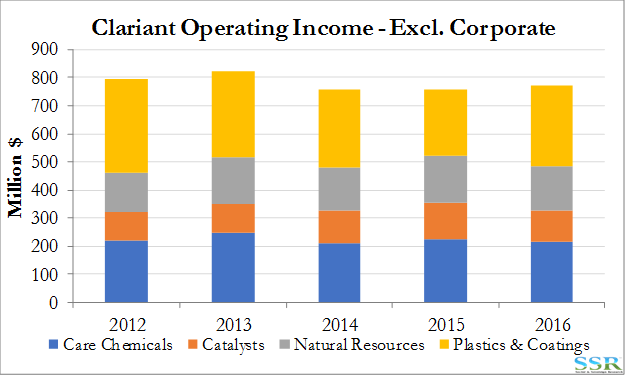 If we combine the operating income streams we get a business that has less volatility than Huntsman has shown over the last 5 years but only slightly more than Clariant – Exhibit 5. Note that with only 5 years of data, the analysis does not include a robust sample set. 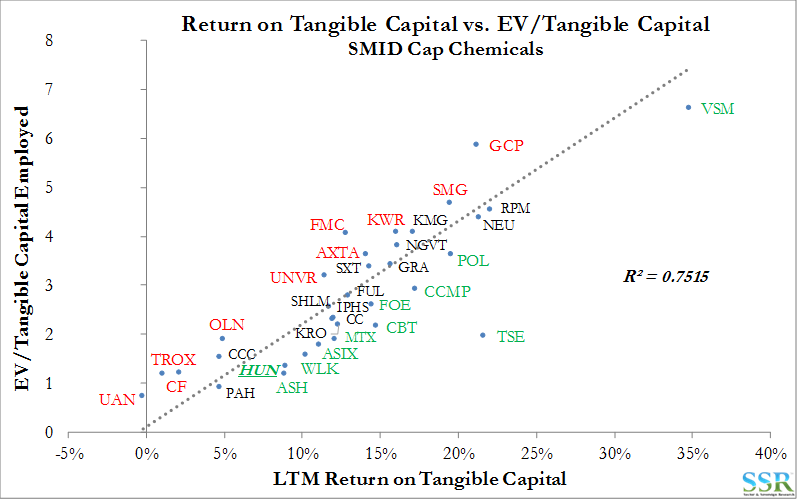 Huntsman does not look expensive on our return on tangible capital analysis – Exhibit 6 – but not as cheap as some of our preferred names such as TSE, ASIX, WLK and VSM. We still maintain that the combination may present some risk to the overall multiple, even though earnings volatility may not rise meaningfully, and that synergies are all you are playing for, and they look like a stretch target – see prior research. We believe that the merger with Clariant is probably the only real option for HUN but we would not buy the stock on that basis.